4. Extremely bright, please wear glasses when using to avoid intense light to stimulate the eyes. 5. Indoor use only, non-waterproof. Two year warranty is our promise. If your products have any problem, please feel free to contact us by email. We will give you the best solution according to your exact problems. Efficient & Professional: Ideal spectrum for the growth stage of plant germination to flowering, rapidly promote healthy plant growth and soonest flourish, maximizes the economic efficiency of indoor plants production, quality, and nutritional potential in a scientific way. Low Heat Output: High speed cooling fans VS upgraded aluminum heated sinks make this plant growing lamp superior. Quickly reduce the heat accumulation above 70%, not only ensuring the long time stable operation of the growing lamp but also protect the power supply, help to extend the service life of the lamp reaches more than 50,000 hours. Energy Saving : Compare to traditional 600 watt HPS/MH while consuming only 245 watts, the electricity is 0.25kW·h per hour. Low power but high brightness, Led grow lights are up to 70% more efficient than HPS grow light. This is the best way to save from the traditionally of high costs. Customer Service: All the LED grow lights have good performance. Everyone can enjoy the free professional plant growing advice. Provided 2 years warranty and 30 day return service policy. Any question, please free feel to contact us! 【Add Both ASINS to Cart (B075YNV196,B01LWN1IQ0)!! 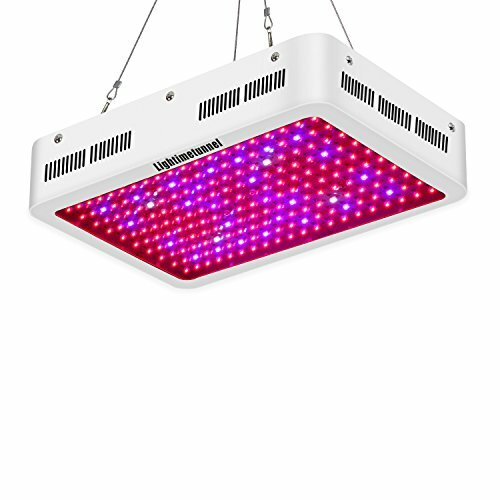 Buy One Get One 】ONLY $99.99 you get 1pc 600W Growing Light and 1pc Grow panel. Compare to the other 600 watt HPS/MH , their working power just above 100w ! Our Actual Power is 245watt ! Equivalent to 2pcs the other 600w Grow Light which actual power is 120watt! we use 3W Epiled diodes provided the ideal balance of canopy penetration, the light was able to penetrate up to 5 feet past the plant's canopy and can be almost fully absorbed.